Your building will likely need re-pointing in Boston if you have noticed that your mortar or masonry blocks have begun to crack, fall out or disintegrate. Cracks and missing mortar will allow water to penetrate into the heart of your masonry structure, which can result in the breaking away of interior plaster walls; the rotting of wooden framing, flooring and moldings, and; the deterioration of your bricks and stones through freezing and thawing. 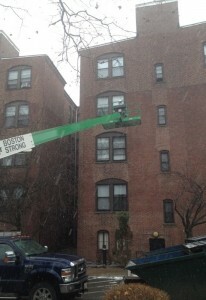 Our well-seasoned team will perform your re-pointing in Boston according to exacting industry standards. Gilrace Masonry & Waterproofing Inc. methods have earned an impeccable reputation with business owners throughout Boston. One of the most important steps to take as you begin your commercial building restoration and waterproofing in Boston is contacting the appropriate zoning and permitting committees to get your project off the ground. We know how confusing that can be, because there is more than a single committee that oversees building projects in the city. Every project has to be reviewed to ensure that its plans are in compliance with the building zoning codes. All work preformed on historical building in Boston are reviewed and approval must be sought from the Environmental Department for any structural work being preformed. This process begins with an application to both the building and historical departments in Boston. The request to preform the work on historical building in Boston is approved by the Environmental Department first which can take up to 4 weeks as there are monthly board meeting in order to approve the work. Violations of zoning and building codes can result in lengthy and expensive delays, harsh fines and even tear-downs of whatever structures were erected without committee approval. This is one aspect of the building process that can not be overlooked. At Gilrace Masonry & Waterproofing Inc, we ensure that building, historical and street permits, police detail if needed are in place prior to the commencement of the project. The organization of the project is an important component to a successful completion of the project.